Can a thin person write about fat? In recent years a field of study that has come to be entitled ‘fat studies’ has developed, largely in response to the discourse around obesity in developed countries. Just as gays, lesbians, bisexual and transgendered people have chosen to reappropriate the once pejorative word ‘queer’ for their own purposes, attempting to reinstate it as a positive self-identifying and political term, some academics and activists seek to use the word ‘fat’ to describe corpulent people in a positive, accepting manner. 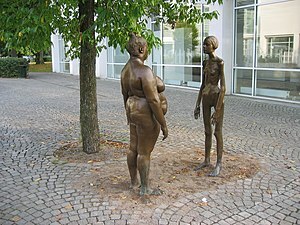 In her foreword to The Fat Studies Reader, a ground-breaking collection of radical essays critiquing dominant cultural representations of fatness, well-known fat activist Marilynn Wann (2009: ix) defines fat studies as ‘a radical field, in the sense that it goes to the root of weight-related belief systems’. She contends that fat studies rejects the following assumptions: ‘that fat people could (and should) lose weight … that being fat is a disease and fat people cannot possibly enjoy good health or long life … that thin is inherently beautiful and fat is obviously ugly’ (2009: ix). they often adopt a feminist or queer approach in their critiques. There is no lack of evidence to demonstrate that these writers are correct in identifying highly negative meanings and experiences around fat embodiment, many of which have been apparent in popular and medical discourses for centuries (see here for my discussion of fat phobia). A central theme for many writers in fat studies, as well as in the areas of what are variously entitled ‘fat activism’, the ‘fat acceptance movement’ or the ‘size acceptance movement’ is that they themselves identify as ‘fat’ people. Adopting the position that ‘the personal is the political’, they view their activities as part of a political project. Other scholars prefer the terms ‘critical obesity studies’ or ‘critical weight studies’ to describe their writings on the social and cultural dimensions of obesity discourse (for example, the contributors to the collection edited by Rich, Monaghan and Aphramoor, 2011). The emphasis in these terms is on the word ‘critical’, as these scholars seek to identify and challenge the taken-for-granted assumptions circulating in mainstream lay discourses and in the biomedical and public health literature on obesity/fatness. Here again, many of these writers actively avoid the use of the term ‘obesity’, preferring instead to use the term ‘fat’. Such writers may themselves identify as fat, but this is not the case for all or even many of them. Some commentators in fat studies and fat activism have expressed very negative opinions about people writing on the topic who do not themselves identify as fat. When I was working on my book on fat politics and fat embodiment (Fat, published this month), this was an issue of which I was highly aware, as I have always been a thin person and have therefore never personally experienced the stigmatisation and marginalisation to which many fat people have been subjected. However, as I point out in my book, fat people are not the only individuals who have been singled out for attention in contemporary anti-obesity discourse. Mothers of young children, regardless of their own body weight, have been positioned as key targets in anti-obesity campaigns and programs because they are viewed as responsible for monitoring and disciplining their children’s diet and weight. As one such mother, I have found myself the subject of moral discourses in relation to the ‘child obesity epidemic’ , implicated in the network of expert advice directed at mothers (see here for a previous post on the topic of maternal responsibility for children’s weight). The voices of mothers with young children have not often received attention, except when researchers want to determine how well they are conforming to advice on controlling their children’s weight. Yet there are many difficult ethical questions to negotiate as a mother in response to weight control issues. How, for example, do mothers ensure that their children are healthy without instilling a hatred and fear of fat or of their own body if they do not conform to the ideal of slim embodiment? Another argument against the rigid categorisation of people as ‘fat’ or ‘not fat enough’ to write about the politics of fatness and obesity is that fatness is a fluid and unstable category, depending on the historical and cultural context and personal experience. People who may officially be categorised as ‘normal weight’ according to medical guidelines such as the Body Mass Index (BMI) may still feel ‘fat’, particularly if they aspire to or admire the kind of extreme thinness displayed by models and celebrities. People who were once medically categorised as ‘obese’ or ‘overweight’ but then lost a great deal of weight and reduced their weight to a ‘normal’ BMI may still identify as ‘fat’. Conversely, people who have always been large-bodied may resist being labelled ‘overweight’, ‘obese’ or ‘fat’ because they view their weight as normal and appropriate for them. What has been considered ‘fat’ in one historical era has fluctuated according to the prevailing norms of beauty and medical advice. Further, it may be contended that everyone, regardless of body shape or weight, is caught up in or reacting to obesity discourse in some way or another. According to several public health campaigns and policies, we are all potentially fat people, unless we take steps to constantly monitor and discipline our bodies. Whether or not we identify as ‘fat’, it is difficult to escape the prevalence and dominance of anti-obesity discourse and fat phobia. Willingly or not, resistant or accepting, we are all implicated in the contemporary discourse that positions fat people as morally deficient, undisciplined, sick and inferior. Rich, E., Monaghan, L. and Aphramor, L. (2011) (eds) Debating Obesity: Critical Perspectives. Houndmills: Palgrave Macmillan. Wann, M. (2009) Foreword: Fat Studies: An invitation to revolution. In Rothblum, E. and Solovay, S. (eds), The Fat Studies Reader. New York: New York University Press, pp ix-xxv. My latest book Fat has just been published as part of Routledge’s Shortcuts series. In contemporary western societies the fat body has become a focus of stigmatizing discourses and practices aimed at disciplining, regulating and containing it. Despite the fact that in many western countries fat bodies outnumber those that are thin, fat people are still socially marginalized and treated with derision and even repulsion. Medical and public health experts insist that an ‘obesity epidemic’ exists and that fatness is a pathological condition which should be prevented and controlled. Fat is a book about why the fat body has become so reviled and viewed as diseased, the target of such intense discussion and debate about ways to reduce its size down to socially and medically acceptable dimensions. It is also about the lived experience of fat embodiment: how does it feel to be fat in a fat-phobic society? 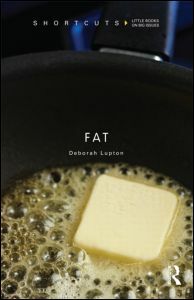 Deborah Lupton explores fat as a cultural artefact: a bodily substance or body shape that is given meaning by complex and shifting systems of ideas, practices, emotions, material objects and interpersonal relationships. Fat reviews current scholarship and research into obesity discourse and politics, drawing upon critical perspectives offered in the humanities and social sciences and by fat activism and the size acceptance movement. It will be an engaging introduction for the interested general reader, as well as for students across the humanities and social sciences. When it was announced last month that Marissa Mayer, the new CEO of Yahoo, a Fortune 500 company, was six months’ pregnant at the time of her appointment, many commentators in online and traditional news media forums were approving. It was noted that Yahoo’s decision to appoint her was a sign that women had come a long way and were no longer as disadvantaged by their reproductive choices. When Mayer further announced that she would only be taking few weeks off on maternity leave following the birth of her baby son, and that she would work from home even during this brief period of leave, again the reaction of many commentators was positive. It was argued that a good example was being set and that women even at the very top of their professions could both reproduce and continue in their successful careers. The issue of the successful woman ‘having it all’ resurfaced for debate. Some commentators were concerned that Mayer’s decision to work through an extremely brief maternity leave would raise the expectations of employers in relation to their own female employees. Several ‘mummy bloggers’ pointed out that Mayer may not realise how having a baby may affect her priorities. Interestingly enough, little mention was made of the huge attention given only weeks before to Anne-Marie Slaughter’s article in The Atlantic, in which she identified the difficulties she and others had experienced in juggling motherhood with an extremely high-profile and demanding job. To make it clear, I do not doubt that Mayer will be able to perform at the level expected of her during her pregnancy and following the birth of her son. I agree that it is salutary that she was promoted to the top job by recruiters who knew of her pregnancy. I imagine that Mayer will not display the projectile vomiting and uncontrolled emotional volatility evidenced in the pregnant women in the recent film What to Expect When You’re Expecting, an exaggerated portrayal of pregnant embodiment played for laughs (see here for my previous post on this). What I do want to do in contributing to this debate is bring the body back in (rather more subtly than this film did) and suggest that these bodily experiences may make Mayer’s first year in the job more challenging than if she had not gone through them. All the noises of approval emerging in the traditional and social media, and the comments of Mayer herself, failed to acknowledge that pregnancy, childbirth, the post-partum period and the care of infants are supremely embodied experiences. The classic Cartesian mind/body split is evidenced in these discussions, assuming that one’s disembodied mind or will can and should take precedence over and control one’s fleshly body. On one level the acceptance that a pregnant woman soon to give birth will be able to manage a top-level job is a feminist dream. It counters the common ideas in circulation for centuries that women are inferior to men because they are less able to exert rational control over their bodies and are therefore less capable of jobs involving high-level cognitive functioning. Such assumptions position the pregnant, menstruating or menopausal woman in particular as emotionally volatile, a slave to her hormones. On the other hand, however, the discourse celebrating Mayer’s choice to work through her brief maternity leave loses sight of the fleshly body altogether. This attempt to make the body disappear bears with it its own limitations. Even those women who experience few health problems and feel very well during pregnancy cannot avoid the sheer physical reality of moving through space with their expanding and much heavier bodies, as the feminist philosopher Iris Marion Young (1990) has noted. So too, childbirth, however it is experienced, demands much of women’s bodies, and it takes some time for women to recover in the postpartum period. This is especially the case if they have had the major abdominal surgery of caesarean section, extensive damage to the perineum or other physical trauma from a vaginal birth. Mayer will be dealing with these embodied experiences at the same time as she is learning to interact with and care for her new infant. Her baby son will himself be taking some time to adjust to life outside of the womb and making his own embodied needs powerfully apparent. Although no doubt Mayer will have plenty of help from paid and unpaid carers, unless she employs a night-nanny or her partner rises to deal with bottle-feeds, nappy changes and infant soothing during the night, she will experience major sleep deprivation. Even if she does not breastfeed, she will have to deal with leakages and physical sensations as her breasts adjust to hormonal changes following the birth. Mayer is in a rare top position as CEO of a major company. Yet this exalted position means that she, even more than other women, will be expected to conform to what philosopher Drew Leder (1990) has termed the ideal of the ‘absent body’: the body of which we and others are unaware because it is so fully under our rational control. The culture of the professional world in particular seeks to ignore the demands of the fleshly body. Cultural geographer Robyn Longhurst’s (2001) research with New Zealand and Scottish people in managerial work positions, both men and women, found that the interviewees strongly emphasised the importance of presenting a corporate body image at work. This involved being well-groomed, wearing a standard ‘corporate uniform’ of business suit and having a body that was physically fit and not overweight. Even cosmetic surgery is now becoming part of the techniques of the presentation of the professional self for some people in their quest to present the most perfect image possible. All these practices of the self combined to present a corporate identity that was considered tightly controlled of its body boundaries, impervious to outside penetration and therefore powerful and rational. In such a context, the body, in effect disappears: its demands, its privations, its leakages, are all covered over in the interests of presenting a self that is rational, of the mind, competent and controlled. It is for this reason, as Longhurst (2001, 2005) points out, that women in such workplaces often find it difficult when they are pregnant and experiencing nausea, fatigue, the frequent need to urinate or crippling back-ache, all common bodily experiences in pregnancy, as they feel that they must not let their bodies betray them. In pointing out these issues, I want to avoid any suggestion that women are any more at the mercy of their bodies than are men and that they therefore cannot perform successfully in top-level jobs. John Coates (2012) showed in his recent book on male traders at the New York Stock Exchange that much of their behaviour is influenced by fluctuations in hormones such as testosterone, adrenaline and cortisol. This leads in some cases to excessive exuberance bordering on mania or conversely pessimism that can then affect their decision-making and have major repercussions for the economy. As Longhurst’s research showed, both men and women in the professional workplace are expected to conform to a certain body demeanour and presentation. Those individuals who are overweight, perspire heavily, have a drinking problem, have a disability or chronic illness, are emotionally volatile and so on are viewed as not conforming to the desired norm, regardless of their gender. Coates, J. (2012) The Hour Between Dog and Wolf: Risk Taking, Gut Feelings and the Biology of Boom or Bust. Toronto: Random House Canada. Leder, D. (1990) The Absent Body. Chicago: University of Chicago Press. Longhurst, R. (2001) Bodies: Exploring Fluid Boundaries. London: Routledge. Young, I.M. (1990) Throwing Like a Girl and Other Essays in Feminist Philosophy and Social Theory. Bloomington: Indiana University Press. I have recently published a number of blog posts on the topic of digital sociology and using social media for professional academic purposes. I have added a little additional material and collected these posts together in an e-document entitled Digital Sociology: An Introduction. Below is the preamble to this document. The complete document can be accessed here. Like many academics, I was quite oblivious to the virtues of using digital social media for professional purposes for rather a long time. Although I used Facebook for private reasons to keep in touch with family and friends, and had signed up to Academia.edu and LinkedIn to connect with other academics, for several years these were the only social media platforms I used. Then one day earlier this year the scales fell from my eyes. I wrote a piece for an online news and discussion site, The Conversation. This site was designed for academics to write accessible articles directed at the general public, who in turn are invited to comment. After only a few hours following publication of the article, more than 500 people had read it, and several had commented. A couple of days later the post had accumulated over 2,000 views and many more comments. I was amazed by the way such a forum offered instant feedback on my ideas and a large readership. This was such a different model of publishing from the one I was used to: academic journal articles and books, which took many months and often years to appear in print following completion of a manuscript and even longer for responses to appear. I soon decided to set up my own blog so that I could engage in such public engagement under my own terms: yes, gentle reader, the very blog that you are reading here. I then joined Twitter, a micro-blogging social platform that I had previously thought only as a forum for celebrities to post inanities and politicians to spread propaganda (my Twitter handle is @DALupton). Again, I was surprised at what I found. I initially had set up a Twitter account as a way to publicise my blog posts but I then found that it was a really useful way to engage with academics and others working in or interested in the same topics I was. I found that people shared links to interesting blog posts, news articles, journal articles and books. They chatted about their latest research or debated a contentious issue, and I readily joined in. Using Tweetreach, a tool to document how far one’s tweets were travelling, I found that some days I was reaching up to 80,000 Twitter accounts. This is thanks to the exponential nature of the practice of retweeting, where one’s followers retweet one’s tweet to their followers, and so on. The power of online social networks was obvious. I then decided that I needed a way of preserving, curating and sharing all the interesting blog posts and news articles that I had discovered via Twitter. I signed up to Delicious, a digital bookmarking site, to achieve this (my collections are here). I then discovered Pinterest, a curating platform for images, and found that it provided a fascinating way to collect images relevant to my research and share these with others: see my boards here. I set up an account with Storify to make ‘social stories’ using material drawn from the web (they can be viewed here), and shared my PowerPoint presentations on ShareSlide (here). I used Paper.li to start up a weekly newsletter, Health & Society, to publish some of the great information I was discovering online about one of my major research interests. I experimented with Pearltrees to curate and bookmark websites (see these here). Using an online wizard I even made my own app providing key concepts on medical sociology (see it here). And of course I used Twitter to let other people know about these initiatives. After using all these platforms and investigating what they could offer as part of my professional practice, I wrote a post for my blog on how sociologists can use Pinterest, another for the online forum Crikey on making an app for academic purposes, and a further three-part series for my blog on the topic of digital sociology. Digital Sociology: An Introduction gathers together these articles in one place as a resource for others who might be interested in using social media in their practice as an academic, as well as for those who might be interested in what the term ‘digital sociology’ might encompass. I have also added some additional material on using Storify, Pearltrees and infographics tools. Does using these social media tools take time out from other academic work? Yes, of course. But I would contend that it is well worth the time and effort. You can use these tools as little or as much as you want, depending on what you find you gain from them. And judicious use of these tools both contributes to and enriches your research and teaching efforts and attracts more readers to your other more ‘traditional’ academic research outputs. These are surely major goals for any academic. Research: to let others know about mine, to learn about that of others and to gather material to support my research. Creativity: using social media can be a great way to create items to share with others quickly and easily and often in a pleasing visual form. Engagement: social media offer an accessible way to engage with other academics and non-academics.